Vitamin K was discovered by Henrik Dam in 1929 while studying cholesterol metabolism in chicken (see Discovery of Vitamin K and It’s Targets and Antagonists). It is a co-factor for post translation gamma carboxylation of glutamate residues on peptides. This reaction is critical for function of affected molecules. Most peptides undergoing γ-carboxylation are involved in coagulation. Antagonists of vitamin K have an anticoagulant action. Before the availability of direct thrombin inhibitors, vitamin K antagonists were the only oral drugs available to reduce thrombosis risk. Long acting vitamin K antagonists are used as rodenticide. Figure 1 Function of Vitamin K: Vitamin K is a cofactor in the γ-carboxylation of glutamic acid resides on coagulation factors II, VII, IX and X. as well as protein C protein S, protein Z. γ-Carboxylation is a post translational modification that adds a -COOH to glutamate acid (see figure 2 below) and is necessary for activity of the coagulation factors. In the process vitamin K is oxidised to vitamin K epoxide that needs to be reduced to vitamin K. Two enzymes vitamin K epoxide reductases and NAD(P)H- dependent quinolone reductases reduce vitamin K. These enzymes are targets of oral anticoagulants like warfarin. 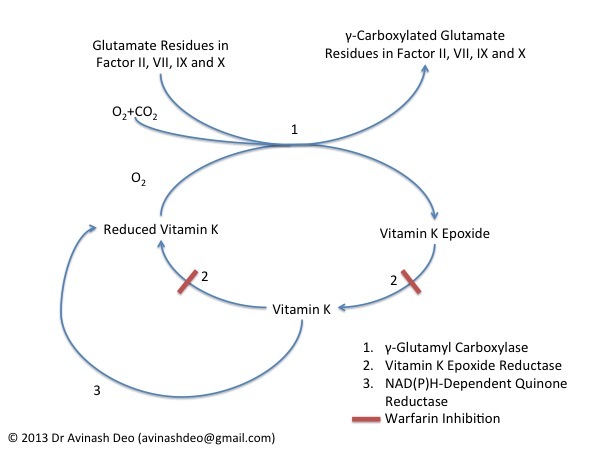 Vitamin K acts as a co-factor for the γ-carboxylation of glutamate residues on prothrombin, coagulation factors VII, IX, X, protein C protein S, protein Z, osteocalcin and Gas6 (figure 1). The reaction adds another -COOH residue to the γ carbon of glutamic acid (figure 2). 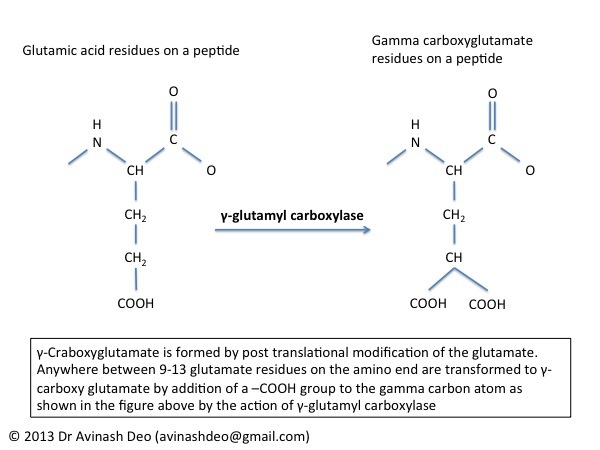 The reaction is catalysed by γ-glutamyl carboxylase and needs C02, O2 and vitamin K. The process results in γ-carboxylation of between 9-13 residues at the amino terminal of the listed protein. Gamma carboxylation is essential for the coagulation factors to undergo a Ca2+ dependent conformational change. The conformation change allows interaction between the coagulation factors and phospholipids present on the surface of damaged vascular endothelium and activated platelets. The vitamin K epoxide needs to be reduced to be recycled. The epoxide is reduced to vitamin K by a pair of enzymes. The first of the pair (vitamin K epoxide reductase) converts vitamin K epoxide to vitamin K and the second (NAD(P)H- dependent quinolone reductases) converts vitamin K to reduced vitamin K. (see figure above). Vitamin K antagonists inhibit the enzymes that reduce vitamin K depleting reduced vitamin K. γ-Carboxylation can not proceed functionally impaired vitamin K dependent factors are produced. The vitamin K antagonists inhibit procoagulants as well as inhibitors of coagulation. On a long term the anticoagulant effect dominates but early on in therapy the procoagulant effect may dominate. This is believed to be responsible for warfarin induced skin necrosis. The risk is reduced by initiating oral anticoagulant therapy under cover of warfarin.